Today, Azerbaijan is a country enjoying a very high reputation on global scale and its initiatives serve as a momentum for regional cooperation, Azerbaijan's President Ilham Aliyev said. 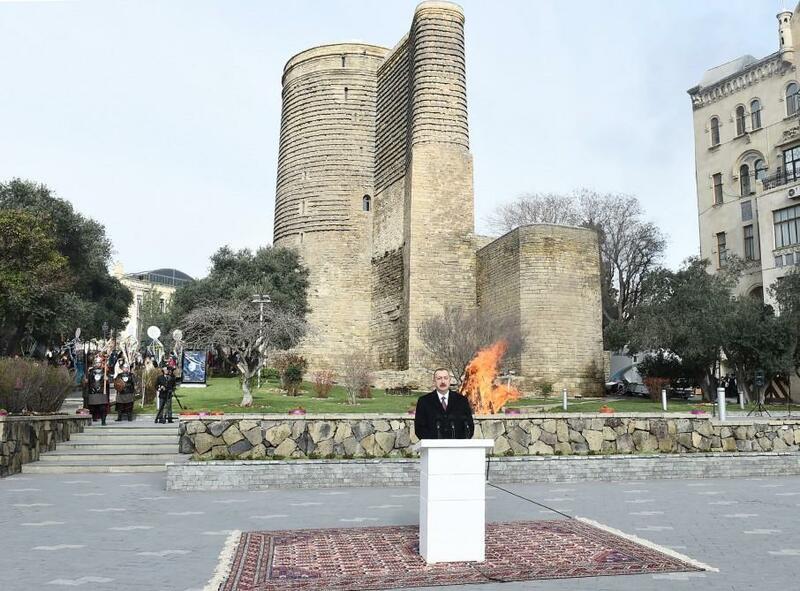 He made the remarks delivering a speech at the nationwide festivities on the occasion of Novruz, the Azerbaijani national holiday, in Baku March 19. The head of state reminded that the 6th Global Baku Forum was held several days ago. About 50 incumbent and former heads of state and government from more than 50 countries took part in the Forum, the Azerbaijani president noted. “I can say the Global Baku Forum, in a short period of time, has been able to take its rightful place among the most prestigious forums in the world. I think the issues discussed at the Baku Forum are very important for the world. A conference of foreign ministers of the Non-Aligned Movement will be held in Baku next month; this is also a global, prestigious international event. Holding this event in Azerbaijan is a manifestation of the regular support provided to us by the Non-Aligned Movement and the organization's member countries,” President Aliyev said. The president emphasized that in most cases, Azerbaijan acts as an initiator in regional cooperation. “A few days ago, for the first time in history, the first meeting of the foreign ministers of Azerbaijan, Iran, Georgia and Turkey was held in Baku. I believe this is a historic event, a historic meeting. Prior to this, and again at our initiative, several regional formats, which function successfully, were created. Trilateral formats, Azerbaijan-Iran-Georgia, Azerbaijan-Iran-Turkey, Azerbaijan-Georgia-Turkey, Azerbaijan-Iran-Russia and, finally, the four-sided format, Azerbaijan-Iran-Georgia-Turkey, were created. I should note that Azerbaijan is the initiator of all multilateral formats,” the head of state noted. The Azerbaijani president emphasized that this strengthens stability in the region and cooperation, ensures economic interests of countries participating in these formats. “The issues discussed cover political, economic, cultural, transport and other spheres. As you know, many big transport projects are being implemented at our initiative in the region. The East-West transport route has already been implemented. Afterwards, the Baku-Tbilisi-Kars railway was commissioned last year, and the route is already functioning. As a result of the full operation of the Baku International Sea Trade Port, the volume of cargo transported through Azerbaijan will be increased by several times in the near future,” the head of state added. “Currently, we are engaged in creating the North-South transport corridor. All the work on this route has been carried out in the Azerbaijani territory. Azerbaijan will take additional measures to fully realize this route. These two important transport corridors create the opportunity for us to come up with new initiatives." "The South-West transport corridor was also discussed at the meeting of the four countries’ foreign ministers in Baku - for the first time, and again at our initiative. Thus, in spite of the fact that Azerbaijan does not have access to open seas, we will turn Eurasia into an important transport center, and there are already excellent results in this direction. I want to reiterate once again that regional cooperation strengthens stability. We live in this region, therefore, undoubtedly, our successful cooperation with the countries of the region will continue,” President Aliyev said.